Warning: This post contains affiliate links. You can read my affiliate disclaimer at the bottom of this page. Yeah, it hurt to write that title. I usually love, love, love to read. I can't get enough of it... most of the time. But a few weeks ago I hit a wall. I bought a few new books, a few used books. I spent more time at my two libraries than is probably healthy. It's entirely possible the librarians thought I was stalking them. I mean, how many times can you walk into a library, skulk around the stacks for a while and walk out empty handed without looking like a total creeper? The thing was - nothing interested me. Nothing grabbed my attention and held it. I go through this sometimes. Please tell me you do, too - that I'm not a total weirdo. I just didn't want to read the same old stories again. I didn't want to watch movies either. I was just... meh. Wanna know exactly how bad it got? One of my favorite authors released a new book, a book I had been anticipating for months. It was out for nearly a month before I bought it. I had it on my end table for another 3 weeks before I read it. This is unheard of. I usually pull an all-nighter devouring her books as soon as I can get my hands on a copy. Yeah, it was that bad. I was seriously considering professional help. Do they have a group for that? That book brought me back to myself. I can't tell you how or why without spoilers but I can say there were some major character developments and a twist that had me in knots with anticipation. Again, yo! Affiliate Links & Disclaimers! The Undead Pool - This is the one I was talking about above. I have loved Kim Harrison's The Hollows Series from the very beginning. I must say, Rachel grew up a lot in this installment. She's calm and collected and more powerful than ever... and she also shows a vulnerable side as well in this book. (mini-spoiler: so does Al!) It's hard to believe that Dead Witch Walking , the first in the series, was written a decade ago. Ten years and eleven books ago... I wouldn't have guessed this series would still be so good. The Selection - In the future, America is a country no more and Illea is a young nation sitting in her place. In order for Prince Maxon to choose a bride, they hold a Bachelor'esque competition among 35 young women from the provinces. Of course he's interested in the one candidate who has given her heart elsewhere... and of course she's surprised to find out he's actually a pretty decent dude. Young, sweet and innocent - it's a little silly mixed with some coming of age stuff and a dash of dystopian fantasy. Nice beach read. The Girl Who Chased the Moon - Anything by Sarah Addison Allen is magical. It's comforting Southern fiction and she always makes me homesick. This one is about a girl called Emily who moves in with her estranged grandfather after her mother's death. She quickly starts uncovering secrets from her mother's past and starts untangling some of the town's secrets. Quirky cast of characters, small town drama. Feels like home. Skin Game - Oh, Harry Dresden, you had me on the edge of my seat with this caper, didn't you? You always do, you sneaky wizard. I tried to stretch this one out for a few days before we left on vacation but that just didn't happen - this book was just too good. I was annoyed every time I had to do anything besides read - anything like, you know, shower, get dressed, eat. It has to be a great story if I'd happily skip a meal for it. The Kill Artist - I've seen this series floating around for many years now but always thought I just wouldn't be interested. I don't know why I thought that and I'm really glad I got this one on my Kindle before we left for Greece. It was a great beach read - a gripping assassin story with a lot of depth to both the characters and plot. This series will keep me happy for a while. Ok, so those are my great reads lately. 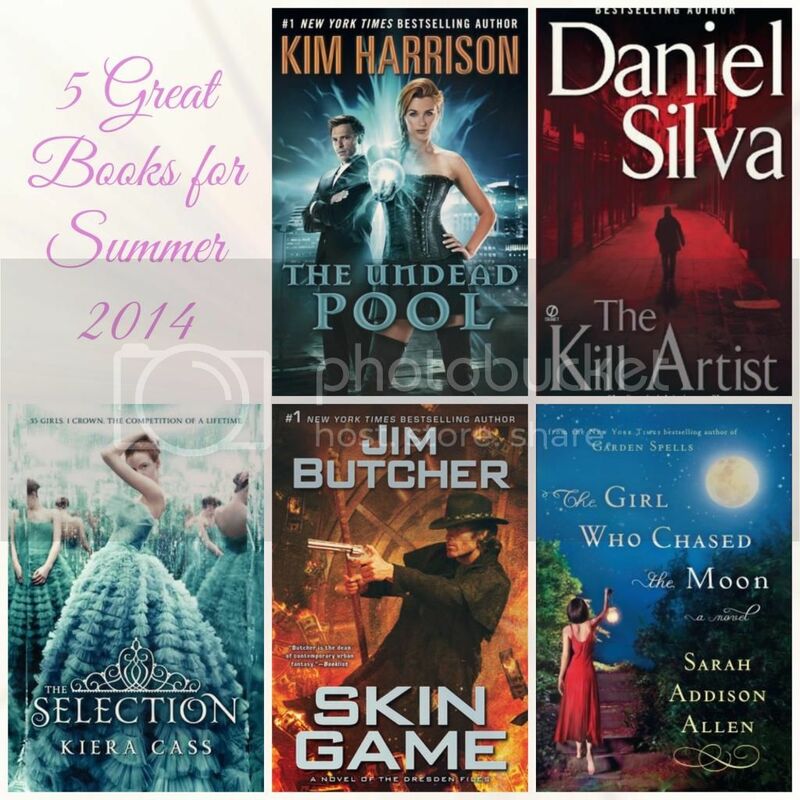 What awesome books are keeping you entertained this summer?